Rupert Murdoch- "The world is changing very fast. Big will not beat small anymore. It will be the fast beating the slow. " Nothing but hard work, taking your opportunities, taking your advantages. 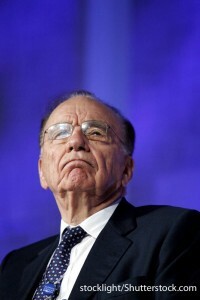 (How Murdoch has achieved his success). I don’t run anything for respectability. I try to keep in touch with the details… I also look at the product daily. That doesn’t mean you interfere, but it’s important occasionally to show the ability to be involved. It shows you understand what’s happening. Is there any other industry in this country which seeks to presume so completely to give the customer what he does not want. I’m a catalyst for change … You can’t be an outsider and be successful over 30 years without leaving a certain amount of scar tissue around the place. What I worry about much more is our ability to make the necessary cultural changes to meet the new demands of the digital native. There is so much media now with the Internet and people, and so easy and so cheap to start a newspaper or start a magazine, there’s just millions of voices and people want to be heard. News…communicating news and ideas, I guess.. is my passion. And giving people alternatives so that they have two papers to read and alternative television channels. The buck stops with me, but I can tick off dozens of very good senior executives that are responsible for hundreds or thousands of people who work for me. I think we’ve been an agent for change, everywhere, and I think change frightens people. They’re going nicely in what seems like a settled industry, and someone comes in and says: “I can do this better. It doesn’t matter how nice that other one is.” That’s one of the distinguishing points of our acquisitions. Size and synergies between the different segments of the company matter. As far as we are concerned, the Internet is broadening our opportunity, as well as for other big media companies with huge resources in sports, entertainment and news. There’s just more opportunity. My ventures in media are not as important to me as spreading my personal political beliefs. In this country, Fox News has gotten a big, big audience that appreciates its independence. There’s passion there, and it’s pushed. … It has taken a long time, but it has now changed CNN because it has challenged them — they’ve become more centrist in their choice of stories. They’re trying to become, using our phrase, more fair and balanced. What does libertarian mean? As much individual responsibility as possible, as little government as possible, as few rules as possible. But I’m not saying it should be taken to the absolute limit.